Do you remember that quote, “winners never quit and quitters never win”? Well I do. It was the mantra drilled in my brain during gym class and half time at soccer practice, our hands sticky from orange slices. I especially remembered this while sitting in a dark classroom in Grade 11 and watching the movie Rudy. 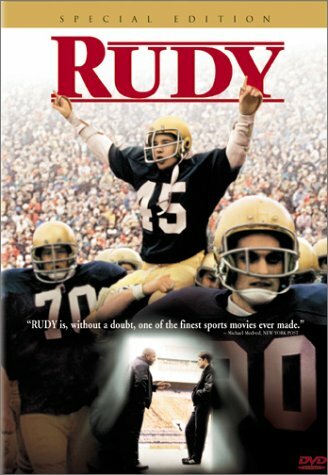 The movie Rudy tells the story of the chubby yet lovable Daniel “Rudy” Ruettiger. A working class kid with mediocre grades, he was repeatedly rejected from Notre Dame University. But he had an unshakable drive to play football for the “Fighting Irish” and was finally admitted to Notre Dame on his 4th try. But at 5’6’’ and 165 lbs, he lacked not only the talent but the physique to play football for a team like Notre Dame. Long story short, he played for a practice squad for two seasons and only in the final game of his senior year was he allowed on the field for three plays, when his team is winning 24-3. Rudy was carried off the field on the proud shoulders of his teammates. Alright parents, send your kids out the room. I want to tell you something. You CAN’T do everything you put your mind to. Some dreams should be abandoned. There are some activities you should quit. Let’s revisit Rudy. He spent years trying to get into Notre Dame and hours and hours on the practice team, never getting to suit up until it didn’t even matter. Yes he got in on those final plays, yes he was an inspiration to many. But you know what he didn’t get? The football career he dreamt of. If he had spent all those hours committed to finding another passion, or practising something he was skilled at, who knows what he could have accomplished. The story of Rudy may not have been of a starry-eyed bench warmer but of a world class pianist. Now before you call me a dream killer, a bubble burster, a Rudy-hater, I am trying to save your time and encourage you to redirect your efforts. People may say that life’s too short to not do what you love. But maybe life’s actually too long to keep banging your head against the wall, trying to accomplish the wrong goal. Maybe you’re better at other things but keep pushing though to accomplish something you’re not meant to, afraid of being called a quitter by your friends, your parents or those bullies from high school. But just remember it’s not always the case that the quitters never win. Facebook newsfeed etiquette. Or why I don’t want to see your stitches. Why 30 is the new 20. But not to your ovaries. Democratic Dazzle. Or Michelle Obama at the Oscars.